Nathan Calwell Hinshaw8,9,10 [Nathan C. Henshaw11,12,13, Nathaniel Henshaw14]. Nathan Henshaw, age 19, born in Missouri; laborer; attended school. W.W. Henshaw, age 24, born in North Carolina; laborer. Henshaw, Nathan C., age 21, born in Missouri; farmer; unmarried; no previous military experience. Henshaw, Nathan, age 28, born in Missouri; teamster; $1000 personal property. Hinshaw, Nathan Caldwell, age 29, born in Missouri; farmer; resident of Analy. Hinshaw, Jonathan Armstrong, age 29, born in North Carolina; farmer; resident of Analy. Henshaw, N., Teamster, Fremont tp. At Ukiah, Sept. 13, 1874, Nathan C. Henshaw to Rebekah Ellen York. Hinshaw, N C, age 35, born in Missouri; parents born in North Carolina; keeps livery stable. Hinshaw, Ellen R., wife, age 24, born in California; father born in North Carolina; mother born in Missouri; keeping house. Hinshaw, Lee, son, age 1, born in California; father born in Missouri; mother born in California. Hinshaw, Wm W., brother, age 46, born in North Carolina; parents born in North Carolina; single; lumber dealer. Hinshaw, Nathan, head-of-household, age 55, born Mar 1845 in Missouri; parents born in North Carolina; married 25 years; occupation: farmer; rented farm. Hinshaw, Rebeca E., wife, age 44, born Mar 1856 in California; father born in North Carolina; mother born in Ohio; married 25 years; 2 children, 2 living. Hinshaw, Wilma, daughter, age 4, born Mar 1896 in California; father born in Missouri; mother born in California. Hinshaw, Rebecca E., head-of-household, age 54, born in California; father born in North Carolina; mother born in Ohio; widow; 2 children, 2 living; owned home (free). Hinshaw, Lee A., son, age 31, born in California; parents born in California; single; occupation: laborer. Hinshaw, Willma, daughter, age 14, born in California; parents born in California; single; attended school. Hinshaw, Albert E. [sic], head-of-household, age 41, born in California; father born in Missouri; mother born in California; single; owned home; occupation: farmer, general farm. Hinshaw, Rebecca E., mother, age 63, born in California; father born in North Carolina; mother born in Ohio; widow. 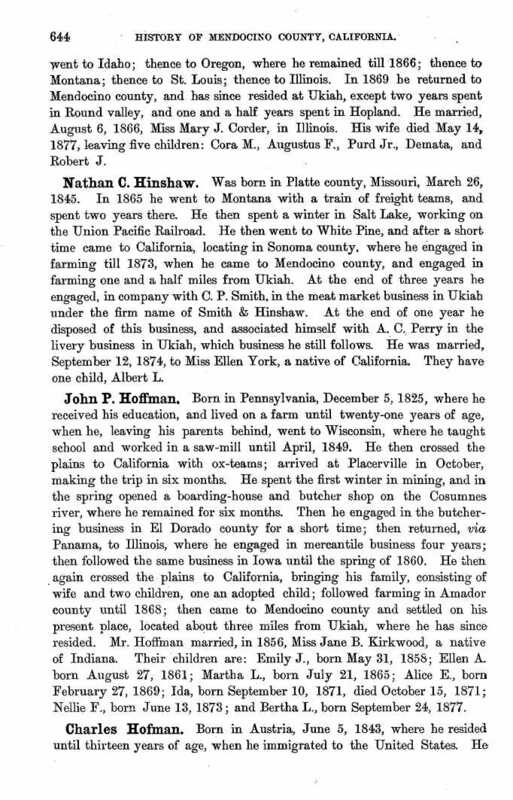 A biographical sketch of Nathan Calwell Hinshaw was published in the 1880 "History of Mendocino County, California"1,28 (see scan below). 1880 census, Ukiah Township, Mendocino County, California; roll T9-0068, ED 57, page 198D, line #1, dwelling #111, family #111. 1910 census, Ukiah, Mendocino County, California; roll T624-88, ED 70, page 5B, line #62, dwelling #91, family #91. 1900 census, Ukiah Township, Mendocino County, California; roll T623-93, ED 76, page 8B, line #72, dwelling #169, family #173. Obituary of William W. Hinshaw, San Jose Daily Mercury Jan 3 1901. (an abstract of the 1850 census); household #310; GR929.3778 E47 in a local library. 1870 census, Alviso, Fremont Township, Santa Clara County, California; page 44B, line #36, dwelling #54, family #53. The "Russian River Flag" newspaper, Healdsburg, Sonoma County, California; Sep 24 1874. 1860 census, Pettis Township, Platte County, Missouri; page 635, line #6, dwelling #854, family #852. California, Voter Registers, 1866-1898; http://www.ancestry.com. San Jose and Santa Clara Directory, 1871-72. The "Russian River Flag" newspaper, Healdsburg, Sonoma County, California; Oct 8 1874. 1920 census, Analy Township, Sonoma County, California; roll T625-150, ED 189, page 1B, line #56, dwelling #14, family #14. California Federal Land Grants, USGenWeb Archives: http://www.rootsweb.com/~usgenweb/ca/ca-land.htm. "History of Mendocino County, California"; 1880, Alley, Bowen & Co.